London-based retailer Evans Cycles is relaunching its in-house Pinnacle brand with 28 models including four road and two cyclo-cross bikes. In tune with the times, and with no shortage of premium kit competing in the marketplace, the new Pinnacle bikes will sell for mostly well under £1,000. Apart from fast commuting, upright town, leisure and off-road machines there are road and cyclo-cross models, the latter recognising, according to Evans’ spokesman, that ‘cross bikes are great for all-round daily usefulness, apart from just racing. 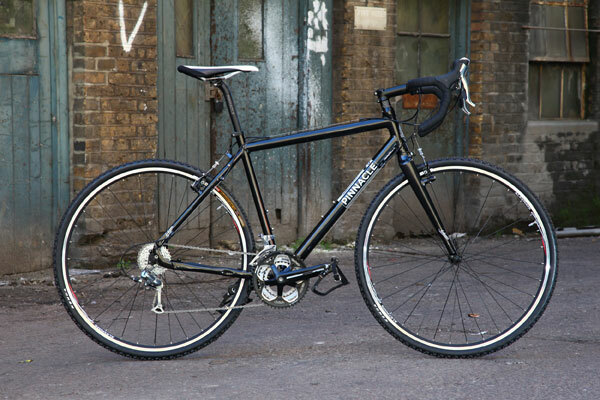 Both crossers; the Akrose One at £799.99 and £999.99 Akrose Two feature the same well-finished aluminium frame which, unridden by Cycling Weekly as yet apart from circuits of Evans’s Bermondsey workshop car park, nevertheless look inviting for the money. Neat hydroformed alloy frame, carbon fork but classic cantilevers for top ‘crosser, the Pinnacle Akrose Two at a penny under the grand. Three Dolomite road models, also on aluminium frames, range in price from £549.99, via £849.99 to £999.99 with even the cheapest featuring Shimano 2300 dual-control gear-and-brake levers, integral headset, carbon composite forks and a competitively low all-up weight. The top £1,000 Dolomite Three model has 2 x 10-speed Shimano 105 gears and shifters which will pitch it right up against the big players like Trek’s 2.1 at £1,075 or the Specialized Secteur Elite at the same £1,000 price but with SRAM Apex gearing. 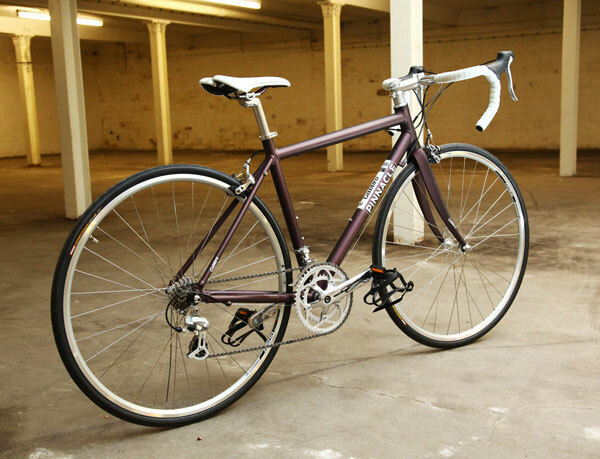 A fourth road model, the Gabbro at £600, has female-specific geometry in a good choice of three sizes and comes in a great matt purple colour which a lot of men are going to like, too. Sadly for them, the standard options are macho matt or gloss permutations on the theme of Urban Black. Cheaper £850 Akrose One gets the same frame but disc brakes. 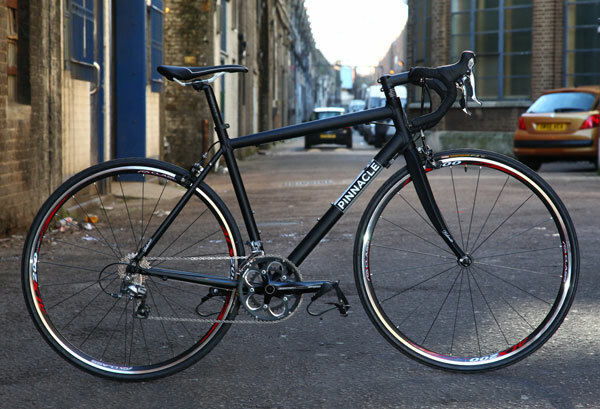 With practical bosses for rack and mudguards, Pinnacle is thinking multi-purpose. 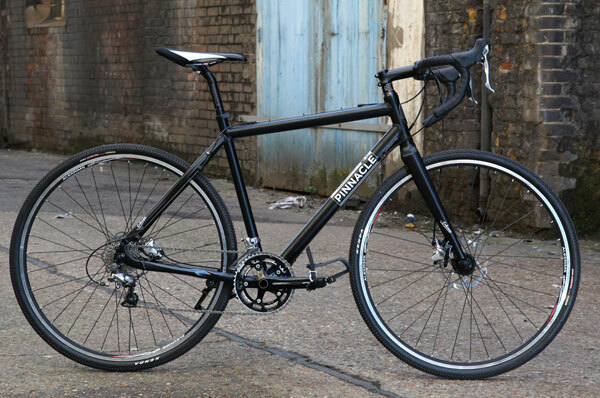 Dolomite Three is the £999.99 range topper of the three new Pinnacle road bikes. 10-speed 105, compact chainset and longer head tube means it’s headed for ‘sportive’ customers. In case you were worried that everything this week is stealthy black, the new women’s Pinnacle Gabbro road bike is matt purple. Just don’t call it ‘girlie’. Since the UCI relaxed the ruling on disc brakes being used for cyclo-cross racing this time last year, it was only a matter of time before the big hitters in brakes, wheels and forks would start introducing ‘cross specific components. However, these are all parts with genuine life-threatening implications if they’re cobbled together in a rush without proper development and testing. Zipp, for example, might well be excited about the implications of a rim that doesn’t need a brake track but it’s pointless until someone builds the brakes and a fork to mount them on. Sneaky peeks of 3T’s prototype cross fork have been doing the rounds these last few weeks but it was only today that we found out the name, which is always a good sign that a product is nearing launch. 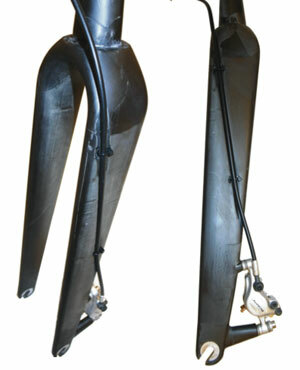 The Luteus fork shown here is still the prototype with its hydraulic pipe routed where we sincerely hope it won’t be in the finished version. Then again, it is very direct. Makers of short-sleeved cycling jerseys have ample opportunity in the darkest, coldest months of the year to think up new ideas ready for when the sun comes out and customers are ready to start buying summer kit again. 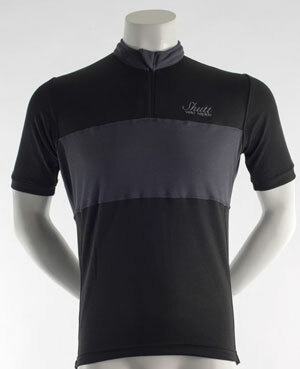 One of this winter’s Merino Perform prototypes, a black and dark grey number, “Immediately attracted the comment that it made the wearer look like a Sandman,” according to Shutt Velo Rapide’s Peter Bragg, who also remembered the baddies from the 1970’s film Logan’s Run starring Peter York and Jenny Agutter. Possibly nervous while it’s still mostly dark in Yorkshire and grey-on-black is still a bit of a no-no for cyclists, Shutt is currently soliciting interest on its Facebook page but the price if it really does join the Spring/Summer line will be £79.